When you buy any products now these days, you can see some lines of codes on the products. That may be a barcode or a QR code which contains details of the product. We need to decode or scan to read the particular information. For example you have seen when downloading mobile apps from some websites, they provide download options with QR codes. So you can download the apps directly from your phone through scanning that QR Codes. QR means Quick Response codes are so popular now that is used by many websites and many types of products. You can also create QR codes containing your own mobile numbers, addresses, and website links also. How to Decode / Scan / Read QR Codes on your PC? There are so many apps to read QR codes for your smart phones. With those apps, you can easily scan through using your mobile phone camera. Otherwise if you’re working on system, you may want this process in some situations. There is free software called "CodeTwo QR Code Reader" that can decode your QR Codes from your desktop PC. This tool is a simple one and you just upload your code only. 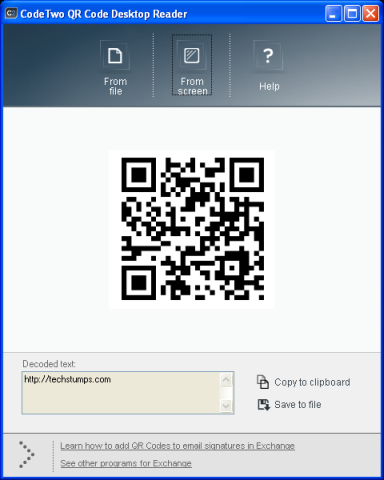 Also a special feature available in this application that allows scanning QR codes from your desktop screen. If you are in a website you can do simply by selecting the proper area of the code. Decoded information will be displayed below the code and you can copy that to clipboard or save to file in your computer. This application comes free without ads, simple to use and worthy one.